The International Conference on Flood Resilience (ICFR) held in Exeter on 5-9th Sep bought together the complementary areas of building resilient town and communities, and improving preparedness through reliable flood models and forecasts. The opening keynote by Dr Hong-Yuan Lee, the Taiwan Minister for the interior, highlighted the scale of the challenge in the face of climate and social changes. Although compared to Asia flooding in Europe might appear insignificant, his over riding message of the need for understanding and clear communication at all levels of society from government through to individual villages is applicable to all. Closer to home Yong Wang illustrated the recent national scale flood mapping project for Scotland and Steve Cole presented an update on the CEH work on “Real-time hazard impact modelling of surface water flooding.” This presentation has close links to our ongoing work in Scotland and highlighted the challenge of taking the next step of linking forecasts to impacts. Looking to the future many presentations, including SueTapsell’s work as part of the WeSenseIt project, looked at how social media could be utilised to improve flood resilience, and encouraged us to not use a lack of data as an excuse to not try to do anything as is most cases much can be done with the little information we have and built on in the future (for example Ole Mark and Jeanne-Rose Rene). 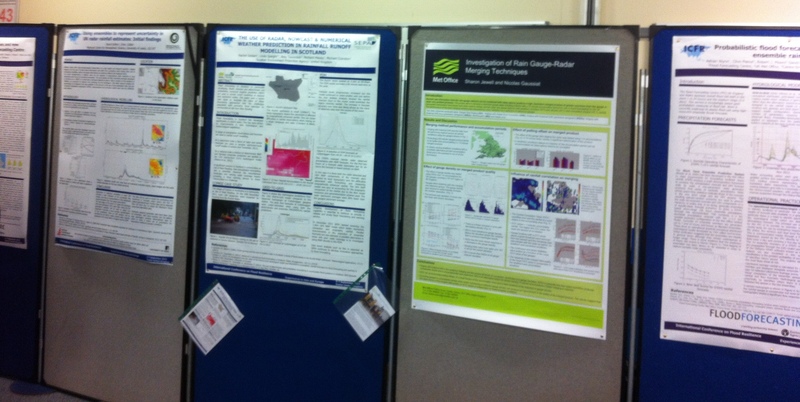 The week was topped off with the news that the SFFS poster on “The use of radar, nowcast and numerical weather prediction in rainfall runoff modelling in Scotland” had won best poster in the flood forecasting and modelling sessions. Click here to view the poster.